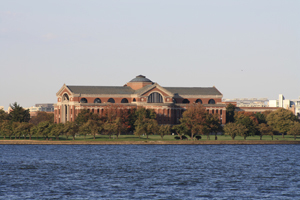 A military reservation was established at the confluence of the Potomac and Anacostia rivers in 1791. Originally named "Greenleaf Point," this site was considered very important for the defense of the City of Washington. Pierre l'Enfant included it his plan for the city. However, the site was not able to withstand the invasion of Washington by the British in 1814.